When you close an application using the HOME key and not the back key, the application may still be working and occupying RAM even though you are not currently using the app. The temperature of your device is related with CPU usage (which at times may require the use of RAM memory) which is affected by running applications. 1 Check Task Manager and close unnecessary programs running in the background. 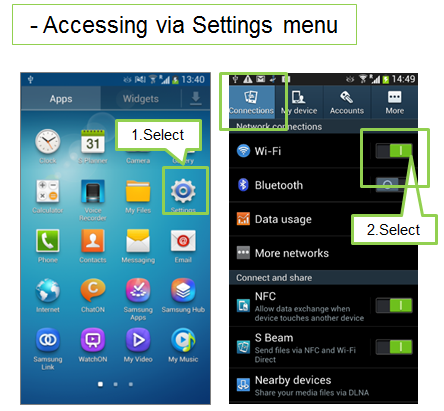 2 Keeping Wi-Fi, Bluetooth, and GPS "ON" is often a main cause of battery drain and can lead to an increase in the temperature of your device due to searching for Access Points (Wi-Fi), Satellites (GPS), and other Bluetooth devices etc. Turn Off Wireless functions when not in use. 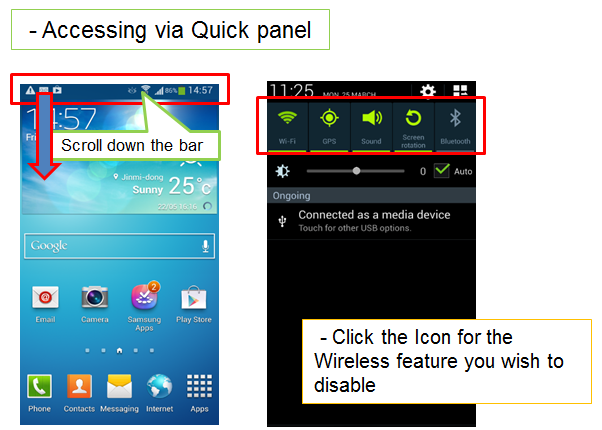 You can use the quick panel menu to toggle Wi-Fi, Bluetooth and GPS on/off, or go into the device settings. 3 Turn off Tethering and Portable Hotspot function when not in use. This will increase the temperature and drain your device's battery. 4 If you set the background colour of your device to a colour other than white this will help to reduce the battery consumption and device temperature. 5 Some 3rd party applications which are downloaded from the Play Store may cause unwanted battery consumption and increase device temperature. Note: After downloading and installing 3rd party apps, remove the application from your device if you feel the device is hotter and battery life is more poor than before.